This was one of those lucky judgement calls for me in my early music exploration. I remember seeing ads for it and reading a review of it when it came out and decided I would buy it, sound unheard. I vividly remember giving you money and having you buy it for me (I think I was only 13) when it came out. Needless to say I loved it. I rocked that tape super hard and still enjoy it now. The only downfall of the album is that many of the songs do blend together somewhat. 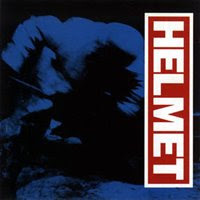 Helmet had their own sound and pretty much did it over and over (at least on the first two albums, this being the second). "In The Meantime" and "Turned Out" are both show stoppers for me and "Unsung" is simply awesome.